The Earth is a mysterious place with the greatest unknowns lying in the oceans, which cover two-thirds of our wonderful world. When you consider the extreme conditions, phenomenal geological features, and eerie creatures that lie kilometers under the sea, your head may begin to hurt a tad. Well, be prepared to have it blown wide open, because when you read about the following breathtaking, awe-inspiring, unfathomable Extreme Oceans that lie beyond our atmosphere and even our solar system, your brain may well explode. 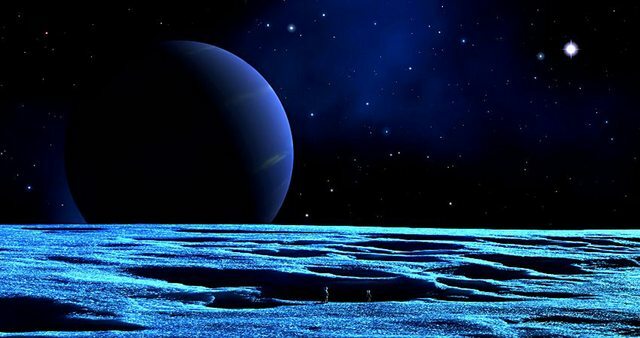 At the outer edges of the solar system lie two icy gas giants, Neptune and Uranus, both of which may play host to incredible diamond oceans. Beneath their atmospheres, both planets have similar mantles made up of water, ammonia, and methane ices. Due to their massive weights, their mantles are under a colossal amount of pressure where the temperature ranges between 1,727 degrees Celsius (3,141 °F) and 4,727 degrees Celsius (8,541 °F). It is under these extreme conditions that the methane breaks up into its core components, producing pure carbon, which under immense pressure forms into diamonds. The high pressure coupled with the intense heat causes the diamonds to actually melt, forming diamond oceans toward the base of the mantle. Just as water in its solid form floats on top of its liquid component, solid diamond will float over liquid diamond, meaning there could well be actual “diamond-bergs” floating on top of the diamond oceans. There are even theories suggesting it actually rains diamonds on Uranus, too. The existence of these magnificent oceans has been hypothesized through experiments at the Livermore National Laboratory, where scientists recreated the extreme conditions of the ice giant’s mantles through lasers, melting diamonds into their liquid form. Should these diamond oceans exist, then we will finally have an explanation as to why both planets have magnetic poles offset from their axes.